Allergy Information: May contain shellfish/crustacean allergens. Note: If you are pregnant or nursing, consult your physician before taking this product. We require more and more out of our bodies each day but unfortunately do not replenish the essential oils it needs on a daily basis to function at maximum capacity. Some “good fats”, including DHA and EPA, are critical components for optimal health but are not produced by the body so therefore are needed to be consume daily either by diet of omega rich foods or supplementation. Studies show that our current Standard American Diet (SAD) is providing an imbalance of fat causing the ratio to range from 10:1-20:1 of “bad” inflammatory fat to “good” heart healthy fat, a pressing health concern for our modern society. Core EFAs provides a superior source of omega-3,6,9 fatty acids and other essential nutrients from the highest quality sources to help support a healthy heart, brain, eyes, and proper balancing of fats in the body. 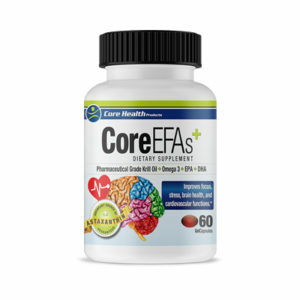 Unlike most essential fatty acid products, Core EFAs is completely derived from pure pharmaceutical grade Krill oil. Krill are shrimp-like crustaceans that live deep in the ocean untainted by toxic metals and chemicals that can be present in our waters today. Scientists are now just dis¬covering all the amazing health benefits krill oil has to offer such as supporting heart health, joint health, healthy cholesterol, better mood and so much more. Krill oil not only provides an excellent source of omega essential fatty acids, but it also contains phospholipids, flavonoids, choline and an incredible antioxidant called astaxanthin. In typical fish oils, the omega-3,6,9 fatty acids are found in the triglyceride form whereas in krill oil they are hooked up in a double chain phospholipid structure. These double chain structures closely resembling that of brain phospholipids and cell membranes making it highly absorbable and bioavailable to the body and far more superior than fish oil. Choline, an essential nutrient found in krill oil, is used in the structure of cell membranes, protects the liver from accumulating fats, and is important to the transmission of nerve impulses. Not only is the absorption of krill oil higher than fish oil but the antioxidant potential is 48 times higher as well. Vitamin A, D and E are critical components of krill oil along with the most potent antioxidant, astaxanthin. Astaxanthin is a powerful antioxidant in the carotenoid family of nutrients and what distinctively gives crustaceans and fish such as lobster, shrimp and salmon their reddish-pink color. Krill themselves consume phytoplankton, a tiny one celled plant high in astaxanthin, which enables them to be an amazing free radical fighter. Astaxanthin is extremely unique in that it can combat many different types of free radicals simultaneously. Other antioxidants can only handle one type of free radical at a time and can become depleted from neutralizing free radicals but this does not appear to occur with astaxanthin. This particular antioxidant also has the potential to cross the “blood-brain barrier” which protects the brain from harmful substances and free radical damage. On the ORAC (Oxygen Radical Absorbance Capacity) scale, astaxanthin scores 550 times higher than Vitamin E and potentially 800 times higher than CoQ 10 and Vitamin C. Its bioavailability is also enhanced in krill oil due to the DHA and EPA structure.